Jerusalem, 09/05/2018 – As part of its series of qualitative medical achievements, the pediatric cardiac surgical team at the Makassed Islamic Charitable Hospital led by Dr. Nizar Hijjeh, specialist in pediatric cardiothoracic surgery and head of the Pediatric Cardiac Surgery Department, has successfully completed an operation on a 3-month-old infant using the “Beating Heart” technique. Makassed’s Cardiothoracic Surgery Department has been using this technique in recent years due to its high success rate and because it helps reduce the risk of complications associated with temporarily stopping the heart during traditional open heart surgeries. With regards to this procedure in particular, Dr. Hijjeh noted that the specificity of this surgery lies in the degree of congenital deformity found in the infant’s heart, such as the pressure of the pulmonary artery on his esophagus, as well as as the presence of a defect in the formational structure of his heart where the aorta and pulmonary artery are located on the same side thus causing the blood circulatory system not to run properly, in addition to a large heart perforation. He stressed that this type of procedure which entails vascular repositioning must be performed at an early age on infants. Dr. Hijjeh pointed out that the procedure of correcting the pathway and position of the coronary arteries, known as unifocalization, was carried out using a modern and rare technology at the regional and global level, that of the “beating heart” technique. This method allows the surgeon to perform the operation without stopping the patient’s heart and hooking him to a heart-lung machine, as in traditional open heart surgeries, thus preventing the infant from experiencing a cerebral hemorrhage, or other complications such as a deterioration of the heart muscle, respiratory problems, or kidney malfunction. According to Dr. Hijjeh, these “beating heart” cardiac procedures take a shorter time to perform than traditional open heart surgeries and can safely restore the heart’s blood flow. Dr. Hijjeh explained that the infant’s surgery had been highly successful and would enable him to grow normally; however, he will undergo another operation at the age of one, in order to repair his perforated heart. On the health status of her infant prior to the operation, his mother said that he had been suffering since birth from repeated vomiting and shortness of breath, noting that his heart’s congenital malformation had been diagnosed during pregnancy. Soon after birth he was transferred to Makassed for surgery, she said, adding that once it was performed a significant improvement in his situation had been witnessed though he is still closely monitored before being able to return home. The Pediatric Cardiac Surgery Department at Makassed Hospital began using the “heart beating” technique four years ago, annually performing a great number of surgeries in order to repair congenital heart deformities. 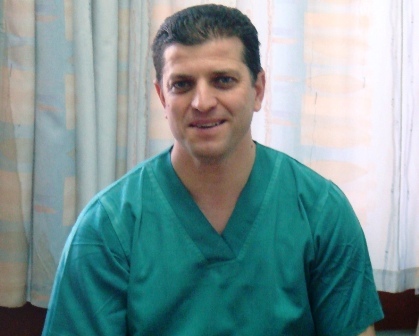 Dr. Hijjeh noted that the success of these operations, which are conducted only in five specialized centers around the world, depends mainly on the level of expertise and competence of the surgeon and the surgical and anesthesia teams, and are carried out with highly precise coordination between the pediatric cardiac surgery and neonatal departments, and the surgical, anesthesia, recovery, intensive care units and teams.